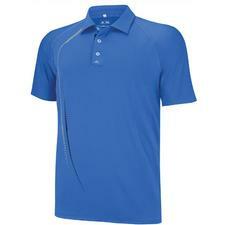 Adidas Puremotion Climacool Graphic Print Polo - Vivid Blue/Black Z77438 - $24.99 - GolfersEdgeOnline.com - Best Golf Equipment On The Web! The Puremotion Climacool Graphic Print Polo has Adidas Climacool technology and the cool graphic print on the body. Climacool is made of anti-microbial, highly breathable fabric that wicks moisture away from the skin for quick evaporation, resists pilling and features mesh ventilation in critical heat zones. This is same this style that is worn on tour by professional golf players. If you have any more questions about the Adidas Puremotion Climacool Graphic Print Polo - Vivid Blue/Black Z77438; do not see the model you are looking for; need custom options; or prefer to not purchase online, then please call us at (630) 656-1291.